I have been scouring the intern et and every cookbook I own searching for the proper baked goods to serve with tea. There are oh so many though and it’s very hard to narrow it down to a few to start with. So I said to myself, how about doing something will all those black raspberries all over the place. They are literally everywhere out there. I picked enough for some cakes, jam, and to just eat plain on my cereal. 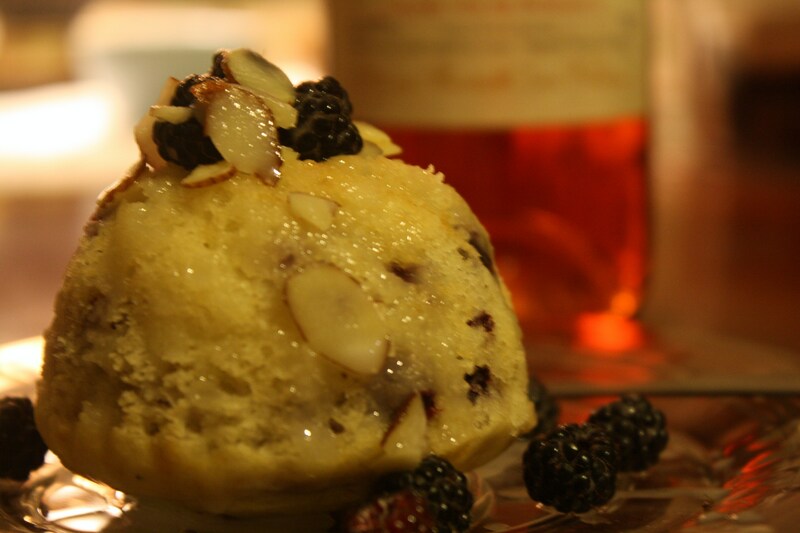 And I found a delicious looking Black Raspberry Almond Tea Cake. The cake itself was delicious. I wish I lived in an area where I could grow almonds. Well you never know very soon maybe we will relocate to California and there I could grow almonds . .. Drizzled over the cake it had an almond glaze and I sprinkled some fresh raspberries on top. The only problem with this cake was that it does not keep longer than the next morning. So it would not be practical for the store. Preheat to 325. Combine all wet ingredients, them mix in sugar. Add dry until well combined, then fold in raspberries. Pour batter into greased mini pans or into a greased bundt pan. Bake for 50 to 45 minutes. For glaze combine cream and almond extract, add powdered sugar until combined into a pourable glaze. Add almonds. Allow cakes to cool slightly, drizzle glaze on top just before serving. Garnish with fresh raspberries. This is a quest that will continue . . .
It’s been a slow and mellow day today. I watered the plants, put the tomatoes out in the sun for a bit, took a walk, and added some books to our Alibris site. I wanted to share the recipe for the lavender creme brulee I made Monday night for a birthday party. It was delicious. Preheat to 325 degrees In a medium sauce pan, combine cream and 1/2 cup sugar. Slice vanilla pod down the middle and scrape out the seeds. Put seeds and pod in the cream mixture, add lavender. Bring to a boil over medium heat whisking constantly until it comes to a simmer and bubbles form along the edges. turn off heat and put the lid on the mixture. Let it steep so the lavender and vanilla flavors permeate the custard. Now whisk the egg yolks very well in a large glass measuring cup, then mix in the hot cream mixture until very well combines. Divide into ramekins. Place the ramekins in a large roasting pan and fill with water half way to the top of the ramekins. Bake until the custard is set but still slightly wobbly in the center, about 35 minutes. Cool on a baking rack then put in the refrigerator until ready to serve. Before serving sprinkle the tops generously with sugar then either use a culinary torch or your oven broiler to melt and caramelize the sugar. This was so good. The lavender flavor was very subtle along with the smooth vanilla. Some day I would love to grow vanilla orchids in the greenhouse. 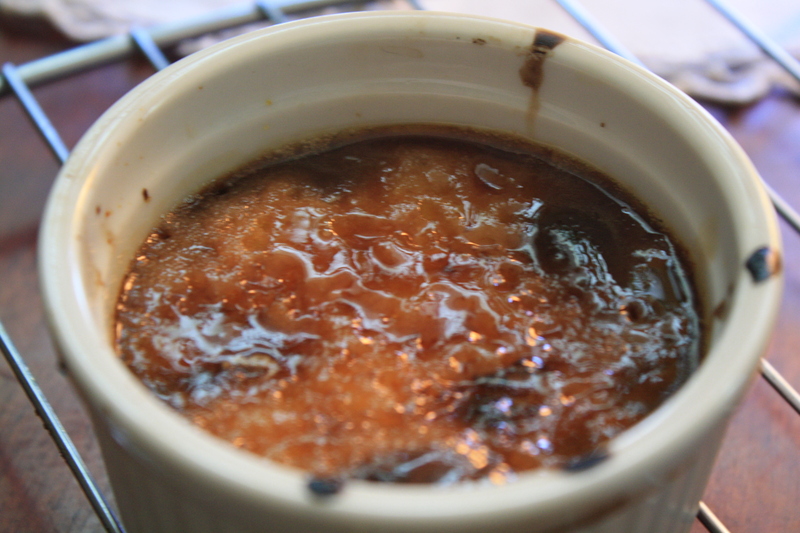 We paired our creme brulee with a pot of loose leaf plum black tea. It was a wonderful pairing. Look for an update on our gardens tomorrow. The mints and herbs are doing great and the veggies are getting big. We’ll be harvesting radishes soon to make a big batch of radish relish for canning. 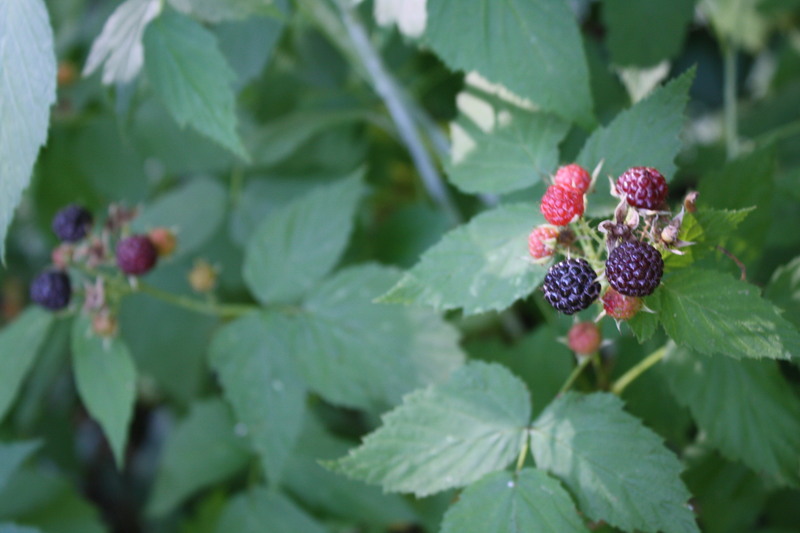 Also the black raspberries are beginning to ripen. They are every where. So we will harvest some of them to dry and incorporate into teas, others to make jams, and the rest for experimenting with. I’m thinking lemon curd black raspberry tarts . . .